Last week I bought this WSO course which was a “Deal of the Day”. It is called The SUPER Traffic Method. Today, I’m going to reveal to you the best form of traffic on the planet. In fact, this special source of traffic has helped me generate well over half-a-million dollars online to date! And then I looked at his Warrior Plus profile picture. Almost 23’000 sales (it has surpassed it now). I knew the guy knows what he’s doing. I might learn a thing or two. This is what made me want to buy the product. I wasn’t sure what I’m getting into to, but my curiosity got the better of me. What’s included in The SUPER Traffic Method course? Once I accessed the page I got greeted by 5 videos and two downloadable files. The videos are about 1 hour 30 minutes long altogether. Mindmap of steps needed to be done to implement his method. A list of Affiliate & JV Groups. What is The SUPER Traffic Method about? It’s about creating your own info products and selling them on sites like JVZoo, Warrior Plus & Clickbank. He went through all the steps that you need to do to make the product, get it in front of affiliates that promote the product on your behalf to their followers/email lists, and everything in between that is important. He even shows examples of his past product launches and how he made more than $70’000 with only one course. The same course can be downloaded for free by following the link in one of the videos. This is the course he made $70K with if you are curious. While I think the videos could have been shorter by half, the main information is good. If you haven’t launched any info products yet, it will be a great introduction to the process. Since I’ve launched some products myself, I already knew most of the stuff, but it helped me acknowledge the power of affiliates and how much pre-launch is needed. When I launched my first product, I did the Rookie mistake by not having a pre-launch page and I didn’t have any affiliates to promote it for me. I had to do all the hard work myself, and the sales were slow in the beginning. By buying this course you can avoid mistakes, and do everything right from the start. Jeremy shows where to get affiliates, how to build connections and how to promote your product launch. For $19 The SUPER Traffic Method is worth the price. 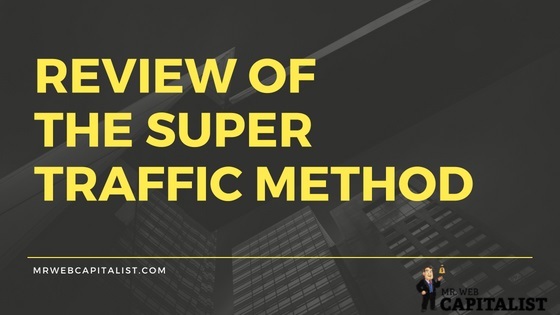 Have you already tried The SUPER Traffic Method? Or do you have any questions about it?